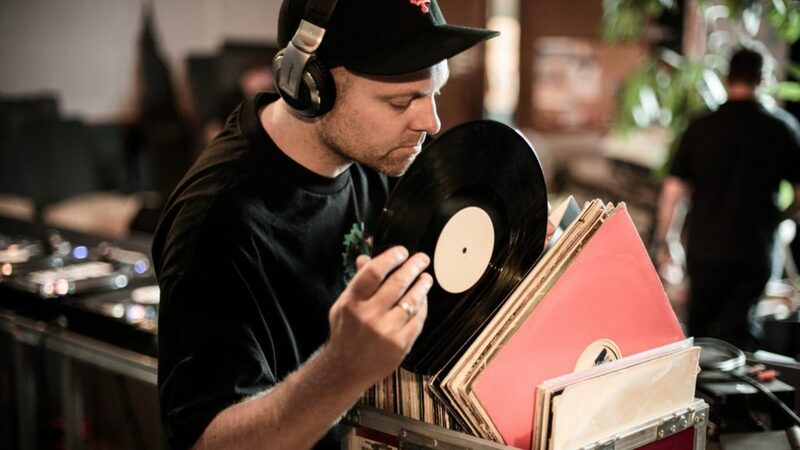 DJ Shadow (born Josh Davis) is widely credited as a key figure in developing the experimental instrumental hip-hop style associated with the London-based Mo’ Wax label. Inspired by hip-hop’s early years, he then grew to absorb the heyday of crews like Eric B. & Rakim, Ultramagnetic MCs, and Public Enemy; groups which prominently featured DJs in their ranks. DJ Shadow’s reputation is largely built on the skill with which he manipulates samples, taking rare and unheard pieces of music and reworking them into parts and phrases for his songs. Many of his tracks feature dozens of samples from a wide array of styles and influences including rock, soul, funk, experimental, electronic and jazz. Shadow famously sampled American composer David Axelrod twice: the piano in “Midnight In A Perfect World” from 1996’s Endtroducing was originally recorded for Axelrod’s “The Human Abstract”; and on his collaboration with DJ Krush, “Duality”, sampling Axelrod’s “The Warnings” (Part 1). Although Shadow currently uses fewer samples than on his earlier albums, several examples feature on 2006 album, The Outsider. His collaboration with David Banner, “Seein’ Thangs”, features a synthesizer and vocals from Cecilia’s “Crimson Red” and “Outsider Intro” includes an excerpt from Ron Geesin’s “Concrete Line Up” from the 1973 album, As He Stands.